The Hereford breed has enjoyed shining success in the steer competitions at this year’s Royal Adelaide Show. Backing up from an impressive set of results at last year’s Adelaide Show, Herefords have once again demonstrated their superior carcase results and finishing ability. The led steer classes were held on Friday 7 September where Tondara Herefords took out the title of Champion Export Steer on Hoof with Tondara Stumpy. The 14-month-old imported embryo steer, sired by GV CMR X161 TIMES UP A152 was exhibited by Eleni Fogden of Loxton High School. Sophie Holt of Tondara Herefords was thrilled about the win for their stud and pleased with how their steer looked on show day. “He [the steer] looked amazing, the school and Eleni did a fantastic job.” Ms Holt said. The Hereford breed excelled in the hotly contested carcase competition, with several notable results across a number of classes. Reserve Champion Export Carcase was awarded to Oak Downs Nugget, exhibited by the Coomandook Area School. The 16-month-old steer was sired by Harvie High Roller and weighed in at 664 kg (liveweight) and dressed at 370.6 kg. With an impressive EMA of 110cm2 and a 64.04 MSA grading, Nugget scored a total of 91.35 points in the carcase competition. Oak Downs Nugget was the highest scoring Hereford and British Breed carcase and the third highest scoring carcase overall in this year’s Royal Adelaide Show Steer Championships. 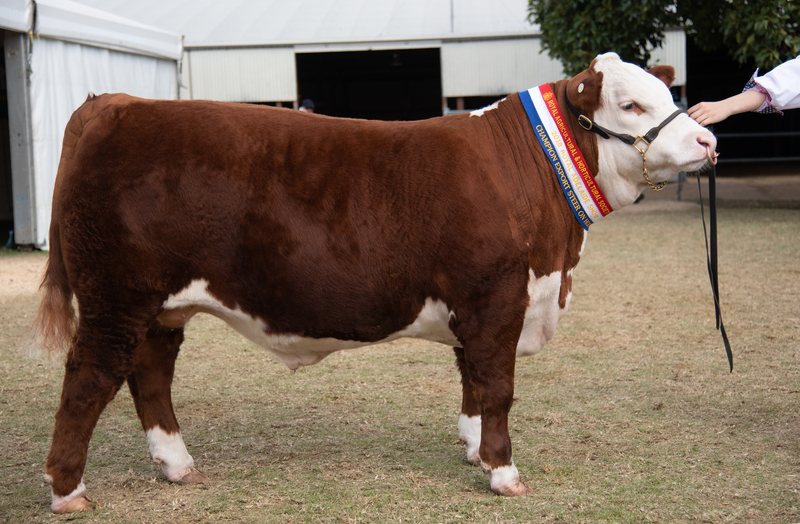 In the Schools Heavy Domestic class, a Hereford steer bred by Minlacowie stud and exhibited by Yorketown Area School came away with the win. The steer dressed at 254.2kg with an MSA Index of 64.03 and earned an impressive overall score of 89.92/100. Tom Honner of Minlacowie stud was very pleased with the carcase result and considered it to be a positive reflection on their stud’s breeding programme. “To win in a class of 46 top steers is a big feather in our cap. “The steer was not extreme in any measurable dimensions but reflects our stud programme of body length and weight-gain coupled with superior eating quality.” Mr Honner said. 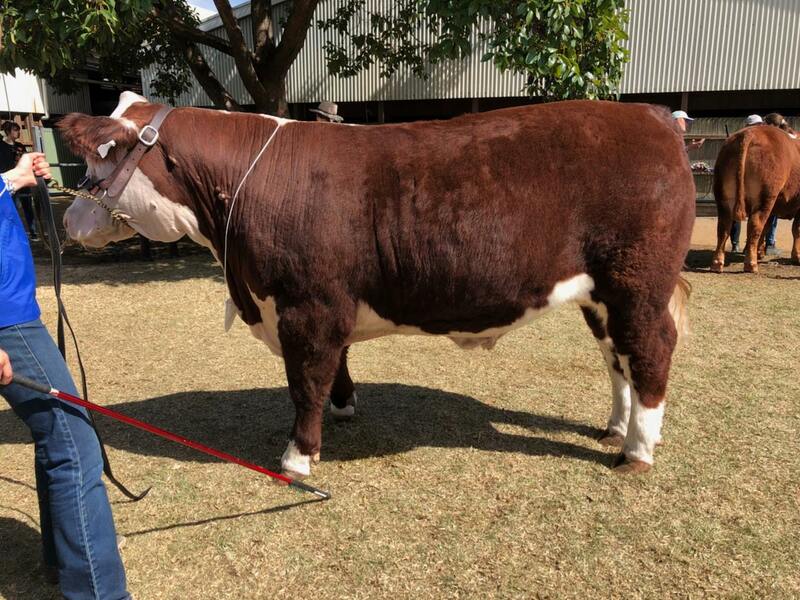 The Minlacowie steer was also awarded the Herefords SA Prize for Highest Scoring Hereford Domestic Steer on Hook. Tondara Stumpy followed up his success on Hoof by being awarded second place in the Purebred Export Carcase class with a score of 86.14. The Hereford breed finished second in the highly coveted Thomas Foods Led Steer Teams Championship with a score of 349.13 out of a possible 400 points for Hoof and Carcase results. The three steers in the Hereford team were Tondara Stumpy, exhibited by Loxton Highschool, Days N077, exhibited by Days Whiteface, and Urrbrae Nigel, exhibited by Urrbrae Agricultural Highschool. The two top scoring Hereford carcase steers were not included in the Hereford team, which according to Tom Honner demonstrates the depth of high-quality Hereford steers that were entered in the competition. The Herefords Australia Premium for any purebred Hereford/Poll Hereford steers on hook gaining 82 points and over was awarded to seven steers in the competition. This is an impressive reflection on the breed as almost half of the Hereford steers entered in the competition reached this benchmark. Tondara Stumpy was awarded Champion Export Steer on Hoof and placed second in the Purebred Export Carcase class with a score of 86.14. Oak Downs Nugget won Reserve Champion Export Carcase and was the third highest scoring carcase overall in this year’s Royal Adelaide Show Steer Championships.